Gus & Lula: My Dream Bathroom -OR- Please Don't Think I'm Crazy! My Dream Bathroom -OR- Please Don't Think I'm Crazy! Nothing much to report from yard sales this weekend. I did find a couple pieces of milk glass, but I think y'all must get tired to death of seeing photos of milk glass all. the. time. So I thought I'd shake things up a little and instead share something I'm filing under "quirky/please don't think I'm crazy". I have been known to have some crazy dreams. One of my all-time most bizarre involved a tandem bike trip to Missouri with my husband with a "falling asleep while operating a non-motor vehicle" citation in Kentucky. Anyway, normally my dreams are very off the wall and just make me laugh when I wake up and remember them. This weekend I dreamed design. (Am I the only one???) I dreamed about a bathroom more specifically. And I kinda liked it. So when I woke up I felt the need to document it. lower half of the walls. It was a dream, remember? *Imperial Trellis paper on the upper half of the walls. *Black and white tile in windmill pattern on floors. *White shower curtain with black details and monogram. Maybe that's why I can't remember the tub? So what's the verdict? Am I absolutely crazy? Has anyone else designed a room in your dreams? Did you like it? What do you think of my subconscious rendering? P.S. For lack of a better tag, I really did label this post quirky/please don't think I'm crazy! I love love love it! How fun is your subconscious!?! I love it! It's so colorful and alive! A bathroom that looked like that would be AMAZING. Anything trellis gets a thumbs-up from me! I love it! And yes, as an Interior Designer, I am dreaming in interiors all the time and I will envision this amazing room and then I wake up and realize that it wasn't real after all and I get a little disappointed. But I definitely feel that my dreams have helped me with my work at times :) Love your blog, I get many great ideas from you as well. I love these combinations!! What an inspiring dream. Thanks for sharing! i dream design too! this one had a lot going on! lol i love the Chiang Mai Dragon fabric, where can I find this? Love, love, love the chandy you made! Can't wait for the details. I love this post : ) You have great design taste-even when subconscious! 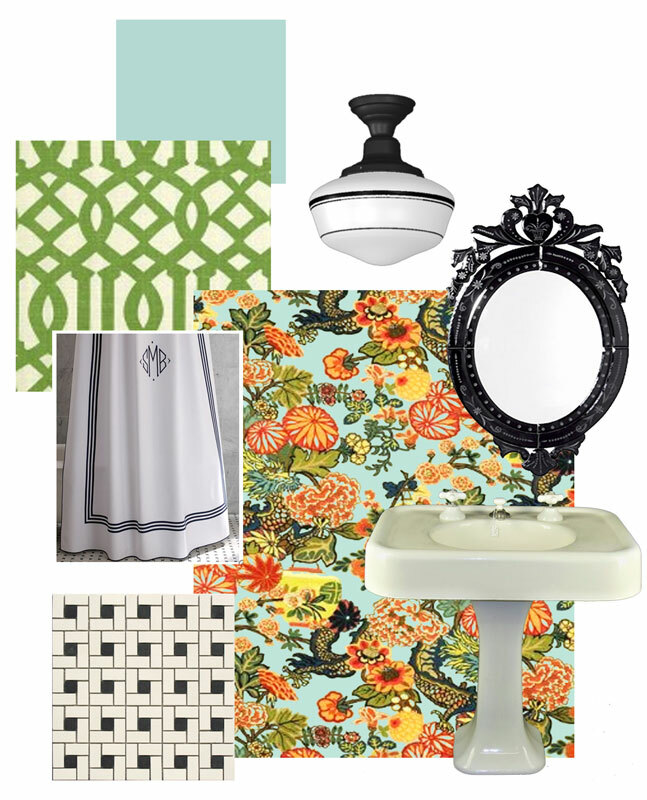 I have been thinking about bathrooms all week, but they haven't slipped into my dreams yet! I just documented my bathroom redecoration and am happy to be done finally! I have almost the same shower curtain but with no monogram. After seeing yours I really want to add a monogram eventually- thank you for the inspiration! Love it too! I wish I was that bold...working on it. I mean, I am doing a blue and gray living area which is way out of my norm or burgundy cliche victorian. We have that basketweave tile in our bathroom and the Chang Mai Dragon pillows in our living room. I like your taste!